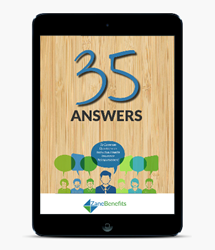 Zane Benefits recently published a helpful guide for small businesses exploring the health insurance reimbursement option—35 Answers to Common Questions on Individual Health Insurance Reimbursement. Readers of the whitepaper will find practical help with navigating the 2016 open enrollment period. It’s not that small companies don’t value investing in health benefits—most do. Rather, continual cost increases and restrictive eligibility requirements create significant barriers for offering or keeping coverage. Readers of the whitepaper will find practical help with navigating the 2016 open enrollment period and useful tips for using individual health insurance to offer healthier employee health benefits.